According to research, Australians work the longest hours in the Western world and around one quarter report that work frequently interferes with other life activities. Many of us are time poor and constantly rushing to juggle different commitments. Work is generally good for mental and physical wellbeing. However, when productive stress becomes overwhelming stress, it can lead to health complications and burnout. Having a strong work ethic is a good thing, however when work becomes all consuming then it’s time to reassess one’s priorities in life. What are the key features of burnout? People working from home where the requirements of work/housework have a negative impact on the work/life interface. Prioritise – think about what’s important in your life and plan accordingly. Ask yourself what is the one or first thing in your life that you would like to focus on right now? Second? Third? Health – regular exercise has proven benefits in reducing stress, anxiety and depression. Factor this in at least 2-3 times per week, although small changes could be implemented on a daily basis. Take a holiday. It is important to take 2-3 weeks off per year. Turn off the mobile, the computer, and enjoy your holiday. Hire a personal coach if possible. 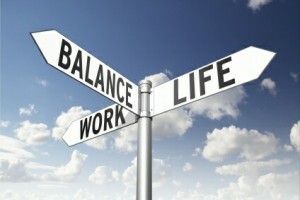 A personal coach can help you assess, implement and focus on achieving a work/life balance. Seek out a mentor. Find someone that you admire for their successful career and positive personal life. Ask for their guidance on career development, time management and setting priorities. Discover what works for them in maintaining a terrific personal life?